19 fun maths activities for the end of term to do in or out of the classroom! Fun maths activities should be a part of every teacher’s toolkit for teaching Key Stage 1 or Key Stage 2. And at the end of term, fun maths activities are not just recommended, they’re essential. Whether you’re a Year 6 teacher, looking to reward your pupils for their hard work in the last few weeks (we’re thinking a SATs well done), or a lower KS2 teacher, looking to build your pupils’ ability to collaborate and reason in Maths, now is the perfect time to bust out of the classroom and into the outdoors for your maths fun. So here are our 19 favourite fun end of term Maths activities to do in primary school. They’ll get your pupils active, learning, and full of great Maths ideas they can even do on their summer holidays to help limit their “summer brain drain”. And don’t worry, in case of a British summer, we’ve made sure that most of these maths activities can also still be done in the classroom. If you have school grounds with lots of twigs lying around, this activity is a must. If not, you can always ask children to bring them in. Get children collecting twigs. Once they have plenty, their challenge is to make the numerals 1-9. Can they make number 2 with 2 twigs? What about number 3 with 3 twigs, and so on? Can they spot the angles they make? Can they make a 3 with 3 angles? A 4 with 4 angles? A five with 5 angles? How about Roman numerals? Could they make a clock face showing all the Roman numerals from I – XII? Let children snap sticks to size if they need to! Finally, can children make sums using Arabic and Roman numerals? For example, 9 x VII = 63. Twigs are great for making shapes and demonstrating a variety of angles. Challenge children to make as many shapes as they can with right-angles. Can they make a regular dodecagon? How many interior right-angles does this shape have? Though twigs aren’t perfectly straight, making right-angles can be great fun especially when children are challenged to build a 2D shape such as a house or a boat. Put children in a group and challenge them to make the biggest shape with 10 pieces of bamboo? Can they make a shape with 12 angles? As an extension, can they make some 3D shapes, such as a tetrahedron using twigs and twine? This one is a great follow up to the sticky activities and helps children discover the natural connection between Maths and art. Link your twig Maths work to sculptor Andy Goldsworthy by encouraging children to design and build their own Maths outdoor works of art. Show examples of his work to inspire children. Get them to combine materials to make different shapes and collect stones, flowers and twigs to create a special environmental art sculpture. As an added bonus, photograph their creations and put them up around your classroom. This Maths activity is perfect for the end of term because it allows children to explore and become enthused about Maths in a natural way, so they look forward coming back to Maths lessons over the holidays. Ask children to explore outside and collect various natural materials such as sticks, leaves, pine cones, etc. Next, ask them to measure various their own body parts and compare their findings with the items. For example, how many pebbles does it take to measure your arms? How many leaves does it take to measure your leg? Discuss why results may vary. This end of term Maths activity is probably best done outside. Mark out a quadrant on the grass and get children to count the numbers of daisies or flowers in a particular grassed area. You can mark out the same sized quadrant in different areas, for example under a tree, by a fence or by a path. Then get children to compare the number of daisies in each section and show their findings on bar charts. For an extra challenge, ask how could they calculate the blades of grass in a specified area? This one is a classic that can be done outside or recreated in the classroom. Find the approximate age of a tree using just a tape measure or piece of string! Children measure the distance around the trunk roughly one metre from the ground. As every 2.5cm of girth correlates to around one year’s growth, they can then work out the age of the tree. For example, a tree with a girth of 100 cm will be roughly 40 years old (100 ÷ 2.5 = 40). Tell children they are going to help the school caretaker solve a problem: he has been asked to plant 10 trees in five rows, so that each row contains 4 trees. How would they do it? For this problem, children can pretend to be the trees themselves and become part of the problem or they could use plastic marker PE cones. Place them in groups and challenge and challenge them. Which group can solve the problem first? Solution: the trees would be planted in a star shape (as below) with each tree planted at each apex and at each intersection point. Once again, these end of term Maths activities are great for the outdoors, but easily recreated inside. Just create paper cut out of leaves for children to work with. Ask children to take a number of leaves from the same tree and then measure the length and width of each one. They can then record the range and calculate the average dimensions using mean, mode and median. Collect together various leaves from around the school grounds or a local park/area. Then compare them by colour, size, etc. using a Carroll Diagram. This activity is discussion-rich because leaves come in all shapes, sizes and colours. As such, children can talk in depth about these differences and how best to categorise them. As an extension, why not conduct a survey of all the different types of trees in your area? You can record findings on a map with a key and then display the number of different types of tree on a bar chart. If you don’t have twigs, why not use rulers or glue sticks for this fun end of term Maths activity. Or ask children to bring them in from their walk into school. Use twigs to create a variety of ‘matchstick’ puzzles but on a larger scale. 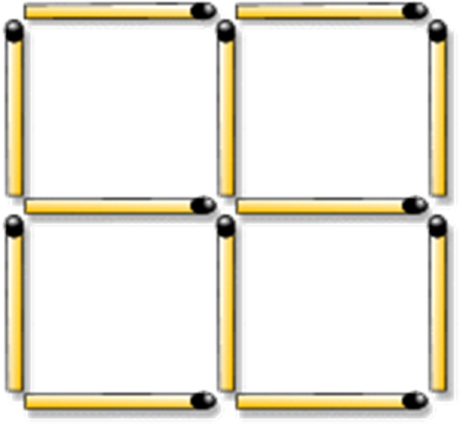 Move two twigs to make 7 square rectangles. Can they work out what to do? There are hundreds of matchstick puzzles to try, so you won’t run out. Take a look at Maths on Fire or copy some examples from the internet to use as problem solving challenges outside. Following this logic, can children work out how many sticks would be needed for Shape 10 (a shape with ten square rectangles joined together)? Can they find a rule? Then you can challenge children to work out what the fifth and sixth shapes in the pattern would look like. Can they develop an expression to show the number of stones needed for the nth shape? Take a look at Transum’s matchstick patterns for more ideas on what to do. Here’s one to act out on the playground or the field. Tell children that a frog has fallen down a wishing well that is 21m deep. The frog jumped 3m every 15 mins then has to rest (the frog slips down 1m each time it rests). If the frog started at 18:00 what time did it reach the top of the wishing well? For this you could use a line on a field (or draw one). In groups, children can re-enact the jumping and falling, measuring as they go. Solution: it would take 195 mins to cover the distance and it would reach the top at 21:15. This leapfrog maths investigation is a great one to act out. You could use chairs as the lily pads, mark out lily pads on the playground or use PE hoops. There are two families of frogs – red and yellow (children can wear coloured bibs to represent these). Each family contains 3 frogs. The red frogs live on the left of the pond, the yellow frogs on the right. One day they decide to swap places! There are 7 lily pads which the frogs must use to cross the pond. Frogs can only jump to empty lily pads. Frogs can only jump over ONE other frog at a time. Frogs don’t know how to jump backwards! Can children master the sequence of moves and work out the minimum number of jumps needed to swap places? Solution: the minimum number of jumps is 15. As an extension, get them to try 4 frogs in each family with 9 lily pads. 5 frogs in each family with 11 lily pads. Finally, try 6 frogs in each family with 13 lily pads. Check out this leapfrog Maths activity by Nrich for more ideas. Another classic maths investigation we all know and love. Acting it out helps children to conceptualise their reasoning as well as having fun with maths. A farmer returns from the market, where she bought a goat, a cabbage and a wolf. On the way home she must cross a river. Her boat is small and won’t fit more than one of her purchases. As such, she cannot leave the goat alone with the cabbage (because the goat would eat it) and she can’t leave the goat alone with the wolf (because the goat would be eaten). How can the farmer get everything on the other side? 1. Take the goat to the other side. 2. Return, pick up the cabbage and take that to the other side. 3. Now pick up the goat again and take it back to where it started. 4. Unload the goat, and pick up the wolf. 5. Take the wolf to the other side where you unload it and leave it with the cabbage. 6. Go back for the goat. Job done! Playing with water inside can always end badly for whoever has to clean up! So this one might be best done outside. At the water tap there are two containers: one holds 5 litres and the other holds 3 litres. How can you pour exactly 7 litres of water into a bucket? Solution: fill the 5 litre container with water. Then pour 3 of the 5 litres of water into the 3 litre container leaving exactly 2 litres in the 5 litre container. Then pour these 2 litres into the bucket and then refill the five litre container and pour that into the bucket. The summer term is a golden opportunity to do plenty of measurements in relation to a range of sports events: throwing the discus and javelin, sprinting, long jump, and more. You can also teach children how to use and read a stopwatch or stopwatch timer on a device. Plus, bean bag target practice is always a hit. This is where you make a target on the ground (usually concentric circles with values) and children throw a number of bags onto the target. They can then add up their score, or value. If your school is holding a sports day this year, we’ve gathered several fun sports day maths activities for KS2 here. Make a 5 by 5 grid using string, or mark it out on the playground using chalk. It doesn’t need to be big (although it can be!). Tell the children that you have ten items (bean bags, cones, tennis balls) that need to be placed inside the grid. Ask them if they can place the objects in the grid so that no more than two objects lie in a line in any direction. As you approach the end of term you’ll also now be very aware of those pupils who aren’t yet ready for their next academic year. By Key Stage 2 many children have developed gaps which teachers will find difficult to plug during whole class teaching. Third Space Learning’s 1-to-1 programme of weekly maths tuition is affordable and very effective at plugging gaps, building confidence and developing children’s ability to reason and problem solve. Children make up to 7 months progress in 14 weeks. Looking for more end of term or holiday maths activities? We’ve also got three very summer holiday based KS2 Maths investigations available to download here including the famous theme park maths investigation. Giving your pupils fun Maths activities at the end of term rewards them (and you) for the year’s hard work. It also leaves a good impression in children’s minds, so they are excited to return to more fun back to school Maths after the holidays. Tweet us @thirdspacetweet and let us know how you get on with these Maths activities or, better still, send us a picture of your pupils doing them! Liked this? Check out these 10 ridiculously fun Maths lessons to try with KS2. Don’t forget to download your free Holiday Maths Pack for Years 3, 4, 5, and 6.